A diet plan proven to relieve symptoms of irritable bowel syndrome and other digestive disorders--presented by the world's leading experts and tailored to you A must-have survival guide --Gerard E. Mullin, MD, Associate Professor of Medicine and Director of Integrative GI Nutrition Services at the Johns Hopkins University School of Medicine What can I do to feel better? For years, millions of adults who suffer from irritable bowel syndrome (IBS) have asked this question, often to be met with scientifically unfounded or inadequate advice. The low-FODMAP diet is the long-awaited answer. In clinical trials, over three quarters of people with chronic digestive symptoms gain significant relief by reducing their intake of FODMAPs--difficult-to-digest carbs found in foods such as wheat, milk, beans, soy, and certain fruits, vegetables, nuts, and sweeteners. 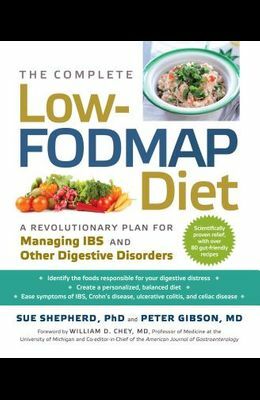 In The Complete Low-FODMAP Diet , Sue Shepherd and Peter Gibson explain what causes digestive distress, how the low-FODMAP diet helps, and how to: - Identify and avoid foods high in FODMAPs - Develop a personalized and sustainable low-FODMAP diet - Shop, menu plan, entertain, travel, and eat out with peace of mind - Follow the program if you have IBS, celiac disease, Crohn's disease, ulcerative colitis, or diabetes, and if you eat a vegetarian, vegan, low-fat, or dairy-free diet. And, with 80 delicious low-FODMAP, gluten-free recipes, you can manage your symptoms, feel great, and eat well--for life.